Joanne Russell is one of two Area 3 Representatives. She is excited by the positive changes happening in NANDC communities; and believes all must have a voice to ensure the interests of residents, homeowners, and stakeholders are equally considered and acted upon. Ms. Russell looks forward to helping NANDC be one of the City’s most involved, united, and vibrant communities. Joanne is a longtime USC/Exposition Park resident, attended NANDC area schools, and has over 30 year of nonprofit human services experience. She is a parent, grand parent, great-grant parent, small business entrepreneur (1st Aide…for your business), nonprofit leader (Let’s Make It Happen), and community advocate. Her favorite past time is singing with the KJLH Performance Choir and the ICYOLA Community Choir. 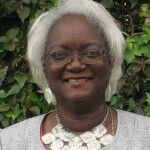 Ms. Russell is glad to be of service and looks forward to meeting and working with you!